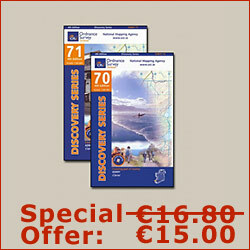 An Riasc is situated on the Dingle Way walking trail and not far from the Wild Atlantic Way coastal drive. It provides panoramic views of the Brandon Mountain Range and the Three Sisters cliffs, perched above Smerwick Harbour and the Atlantic Ocean. An Riasc is a four-star bed and breakfast that is approved by Fáilte Ireland. There are four bedrooms on the first floor, each named in Irish after the view of the window - an Abhainn (the River), na Borraí (the Waves), an Cnoc (the Mountain) and an Fhaill (the Cliffs). All of the bedrooms have an en-suite with a shower. There are complimentary chocolates, made in-house, left on the bedside table and a bottle of fresh water from the well. The televisions in the bedrooms show the local Saorview stations whereas the guest lounge has a basic Sky package for the TV. Original Irish artwork adorn the walls throughout the house, with several of these paintings capturing local scenes from around the Dingle Peninsula. Every breakfast is freshly prepared from when it is ordered off the à la carte menu. Bread and scones are freshly baked and all of the juices are freshly squeezed each morning. A packed lunch can be made for walkers on the Dingle Way to bring out with them on the hills. Some advance notice is needed. An evening meal can also be prepared for guests, providing 24 hour notice is given beforehand. Most of the vegetables come from the organic garden, whereas other ingredients are sourced locally and in-season when possible. Vegetarian dishes are a speciality. There are plenty of options for Dingle Way Walkers to get involved in some extra activities. An Riasc are glad to help organise them. Denise, the hostess of An Riasc, is a cooking enthusiast who writes her own food blog. She gives baking demonstrations to groups of 2-8 people for various traditional recipes. Please enquire about the costs when booking. Although English is commonly used when speaking with guests, Irish is actually the first language of the house. Lessons in Irish, at any level, can be given to groups of 2-8 people. Foreign visitors may be interested in getting a basic session which will bring to life all of the local place-names that are found on the map. Please enquire about the cost of these lessons. In addition to the Dingle Way, there are other self-guided walks in the area such as the Pilgrim's Route or Cosán na Naomh. A guided walking tour can also be arranged and there are further options to hire bicycles, take a boat trip to the Blasket Islands or kayak with Fungi the Dolphin at Dingle.